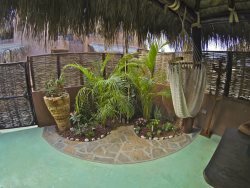 The Master offers a King size bed, private patio with ocean views, an attached full bath, lots of closet space. Bedroom #2 has a King size bed, large closets and mountain views. There is a full master bathroom. *Extra blow up full size mattress and sheets available if needed. The large kitchen is completely stocked with stainless steel appliances, a deluxe gas oven and stove and all the amenities of home. It has a bar with 2 stools. It is a wonderful place to cook a meal as you look out and enjoy the views of the ocean and mountains. The family room offers a large comfy couch, a flat screen TV/DVD player and WIFI. The dining room offers a Mexican dining table with seating for six. It’s open concept, high ceilings and large sliding glass doors out to the private patio lets you experience indoor/outdoor ocean view living. The large, private patio boasts ocean, mountain, and desert views which can be accessed from the master suite sliding glass doors as well as from the family room sliding glass doors. The large patio offers 2 leather couches, coffee table, 2 loungers and a small table and chairs. It’s a perfect place to relax, eat breakfast, drink coffee or margaritas, enjoy the sunset and sunrise, or just enjoy the beautiful day. We are just a short 5-8 minute walk from beautiful Cerritos Beach, where you can swim, surf, watch whales or relax and enjoy beautiful sunsets. Restaurant Napoli is located within Villa de Cerritos complex. There are also several restaurants and bars within walking distance from the condo and the beach.